Posto or post-dana is the Bengali word for Poppy seeds (called khus khus in Hindi). Aloo posto is a simple Bengali side dish made with potatoes cooked in a poppy seeds paste. The seasoning is also light with just salt and green chilies. 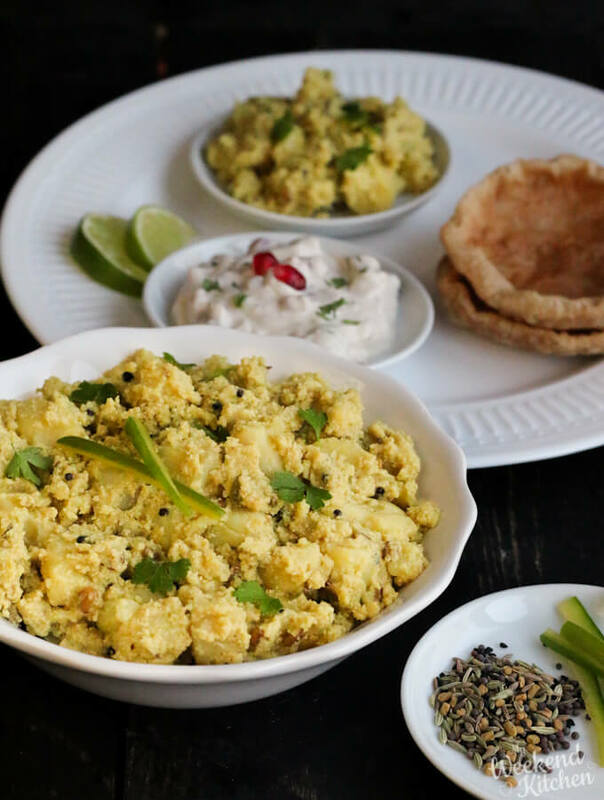 To just say it is a simple side dish from Bengali cuisine, would be downplaying the importance of posto and especially aloo posto in a Bengali household. No Bengali kitchen is complete without posto in its spice cupboard. Aloo posto is the comfort foods in a Bengali household. I learned this recipe from a friend who married into a Bengali family and soon came to love a meal of aloo posto, dal, and bhaat (rice). When she came to visit me, she gifted me a bottle of posto seeds with a note, “You have to try this!”. Well, I did, and I loved it. Apart from aloo posto, I also tried the Bengali baingan bhaja recipe using the posto seeds. Potatoes are cooked in so many different ways all over India and they surely are the comfort food for many. While aloo posto is commonplace in a Bengali kitchen, for us it is a treat. When it comes to making potatoes in a jiffy, I always resort to my dry potato fry. Aloo Posto is a delicacy for us. I recently made a North-Eastern dinner menu when we had friends over with aloo posto and Assamese Boror Tenga curry. It was delicious and different from our regular North Indian cooking. The recipe for authentic Bengali aloo posto is very easy. Temper oil with spices, fry the potatoes, add chilies, posto paste, salt, and turmeric and cook till done. The only tricky part in this recipe is grinding the posto or poppy seeds to a paste. To grind the poppy seeds to a smooth paste, soak them in water overnight or for at least a couple of hours in warm water. Then sieve out the poppy seeds into a grinder and grind fine along with a chili and water as required. Apart from potatoes and poppy seeds, the two other ingredients for the authentic taste are mustard oil and the panch phoran spice mix. Mustard oil lends a deep aromatic nuttiness to the recipe and the panch phoran spices added in the initial tempering enhance that flavor even more. Sauté the potatoes in the flavored oil, add the remaining ingredients and cook covered until the potatoes are done. Simple isn’t it? If you like this recipe, please take a moment to rate it and/or leave your comments at the end of the blog. It will really encourage me to keep exploring, learning and improving. Aloo posto is a simple Bengali side dish made with potatoes cooked in a poppy seeds paste. The seasoning is also light with just salt and green chilies. Traditionally, aloo posto is served with luchi, or poori or dal and rice. Sieve the soaked poppy seeds into the smallest blender jar. I use the spice grinding jar of my mixer. Add 1 chopped green chilli and some water to help the grinding. Heat mustard oil in a flat pan or wok. Bring it to a smoke at medium heat and then reduce the heat to low. Add panch phoran spices to the hot oil. When the seeds start to sputter, add the chopped potatoes. Mix well till all the potatoes are coated with oil and spices. Add the posto paste, turmeric, and slit green chillies. Add ½ cup water and mix everything well. Cover and cook for another 8-10 mins on low heat. Occasionally stir in between to check if the water is sufficient and the potatoes are not sticking to the bottom of the pan. Cook until the potatoes are cooked through. Aloo posto gravy is very thick with the potatoes coated with the posto paste. If you want a thinner consistency add more water in the previous step. Serve hot with poori, or dal and rice. Mustard oil and panch phoran spices are not essential to the recipe. If you don’t have or aren’t comfortable with the strong taste of mustard oil, use regular cooking oil. Similarly if you don’t have panch phoran spices, you can use just mustard seeds and/or nigella seeds. Aloo posto is a great recipe for Navratri and other fasting days as it has no onions and garlic. When making for fasting meals, you may skip the turmeric powder. For Panch Phoran, you can also simply use it to temper other vegetables and curries too. I love the aromatic notes they add to the oil. I am always fascinated by Bengali Cuisine. Poppy seeds and potatoes sounds so unique and yummy. Would love to try it out. I haven’t tried posto with turai yet… great idea! 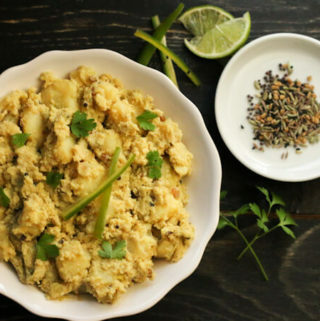 Aloo poshto looks yummy and it’s a perfect side dish. I love Bengali cuisine but never tried this.